My guess is, if you’re pregnant, you’ve got a long list within arms reach. High on that list might be something like ‘must clear out the junk room for nursery.’ But where does all the stuff go? Sound familiar? If you’re anything like me, you love the idea of finally getting organized. You can pin all day long searching ‘how to organize my (fill in the blank)’ on Pinterest. You see those pins, you get that warm, inspired feeling, and then what? You get stuck. You get overwhelmed. You get tired. Inspiration fades. And, the stuff remains, in all its unorganized glory. Enter Suzanne Holsomback. 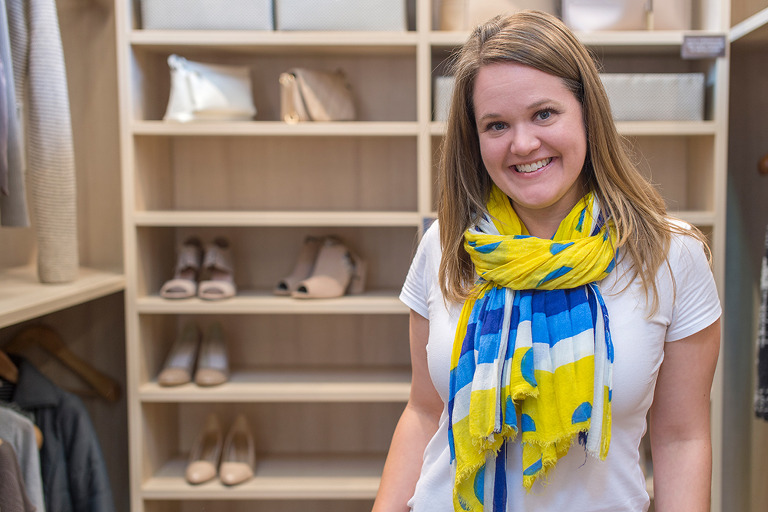 A professional organizer since March 2014, one of her services is working with expecting families to prepare their homes before the arrival of a new baby. Suzanne holds a Bachelor of Arts in Religion and Classics from Baylor University, a Master of Divinity in World Christianity from George W. Truett Theological Seminary, and a Master of Philosophy in Social Anthropology from the University of Oxford. Previously a student union representative and non-profit violence and abuse prevention program manager, she now dedicates her professional life to encouraging and educating people on the benefits of living an organized life through speaking engagements and working one on one with clients. Suzanne is affiliated with the National Association of Professional Organizers (NAPO) and will assume the role of Director of Marketing in the local Austin NAPO chapter this month. She is also affiliated with the National Association of Professional Women (NAPW), Locally Austin, and the Reigning Referral chapter of Business Networking International (BNI). When we learned that Suzanne offers her organizational expertise to help families prep their lives for a new baby, we thought, wow – pregnant moms will want to know this. How many people out there know that they can actually hire someone to help them get their mess together? We wanted to know more, so we sent all our questions to Suzanne. HOLD ON, I CAN HIRE SOMEONE FOR THAT? What exactly do you do as a professional organizer? I, as a Professional Organizer, apply organizing principles to your spaces and schedule to reduce clutter and increase the functionality of the space for you. I will bring a strategic overview to your project and tailor an organizing system to your needs as well as coach you in developing the skills to maintain the organization system. I am actually a Holistic Professional Organizer, so I look at you as a whole person, your physical and mental space as well as your schedule. My specialty leads me to working often with caregivers and individuals with health concerns. Why did you start organizing as a profession? I was working in Higher Education, coaching students on productivity and time management, and after finishing my master’s degree and returning to the United States, thought I could transfer a number of those principles and theories into organizing more broadly. I was also in a time in my life where I needed a career with a lot of flexibility, and owning my own business allowed me to do something I really enjoyed on a schedule that worked with the responsibilities I had at the time! How does one become a professional organizer? What kind of licensing/certification/education is required? There are a number of ways people become organizers. Most organizers are naturally organized people, like myself, and want the freedom of owning their business and schedules. There isn’t a licensing program to become an organizer, but there are training programs. These revolve mostly around building a business. However, I am part of the National Association of Professional Organizers (NAPO) and to be a member we must take classes on theory, principles, and practice. There is a Certified Professional Organizer certification, but one must have over 1,500 hours of paid organizing work documented and taken a test to become certified. I am planning to sit for the exam early next year! Is there a standardized organizing theory to master? I work off several organizing theories. I am a holistic organizer, so I do look at the entire person and space – is the physical clutter connected to time management or mental clutter, etc.? When I work with a client, I ask a lot of questions and weave together an organizing system that will meet their goals, work with their learning style and action style, and reflect their personal aesthetic. 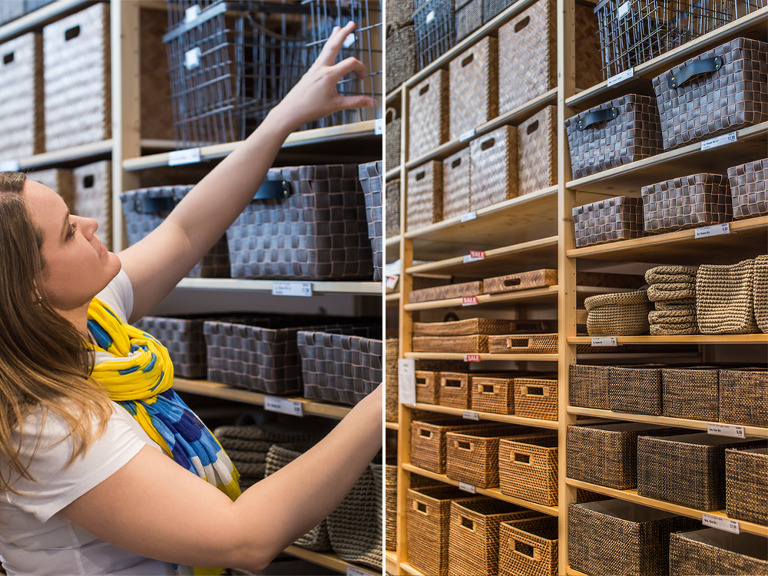 Is your home perfectly organized in every way? Or is it more of a ‘Do as I say, not as I do’ situation? Ha! I love this question and almost always get asked in speaking engagements if I have a junk drawer too! My home is not a Container Store ad; however, no one’s home is. Those photos are staged and I actually live in my home – just like you! My home is organized because every item has a home and it returns to its home when my spouse or I are finished with it. Do we get busy and have little piles form – yes. Most people do. But with a quick tidy up at the end of the day, our home is back to its ordered, organized state. What types of projects are your favorites? I really love organizing spaces where people create – so art studios, craft rooms, etc. They are usually colorful, energetic, and inspiring. Working with a client to make a space for them to dream and create is really fun and hopeful. I also really love coaching the creative souls on how organizing isn’t something that stifles creativity, but really gives it a space to take flight. What is your process? How do you go about creating an action plan for your clients? Will you come into my home and actually give me hands-on assistance? My process is really tailored to you and your goals, so it will be different for each individual and family. In general, I craft an organizing system (or how objects and paper move through your home) around your learning style, work style, and personal aesthetic. For example, I have a client that works from home, but doesn’t really use her office and just feels like she doesn’t have a good structure for working. We are tracking her activities for a week to see what patterns are there and how she can be more productive with her time as well as purging old paperwork and reworking her office so it becomes the place where she works. Her office just doesn’t flow well, so we are going to address the balance of the space and give the visual clutter a home! When I organize, I am there with you every step of the way! I might give a little pre-work or homework, but usually those are the tasks I cannot do for you – like imputing a stack of sticky notes into your day planner or calendar. I work in three-hour blocks of organizing time. This means that I’m in your home for just three hours at a time unless it is a big project that you want done faster, in which I’ll work for six hours a day. I usually like to just do three hours since most people will get really tired by the organizing process and number of decisions that have to be made. If I hire you to help me get organized, will you make me get rid of things? The answer to this question really depends on the project. I’ve had several clients that just needed the space maximized and organized, so we really didn’t remove anything from their home. I’ve had others where my SUV was stuffed with donations. Basically, I work of the principle that I will not throw away your belongings. I do not own them, and I cannot decide if you should keep them or not. I can walk with you through the decision-making process and help you downsize, but I cannot make you do anything or get rid of anything. If you really need to reduce the number of your belongings, then that is the goal we set and I’ll help you reach it. Why is getting and staying organized such an elusive goal in the first place? Getting organized is elusive mostly because it is really overwhelming. It is overwhelming on where to start, being faced with the real amount of “stuff,” how to move through the project, all the decisions, and what to do with what you want to remove. Also, I think you might assume it’ll take a long time. If you meander through an organizing project it likely will take a long time, but working with an organizer is like working with a personal trainer. We have a plan and a goal and a set amount of time and we are gong to get to our goal in the time allotted. Why hire a professional to organize your home? What can you do that your clients cannot? You should hire a professional organizer if you want an organizing system that works for you, your family, and your home. Hiring a professional organizer also allows you to have someone outside of your family encourage you, keep you moving through an organizing project in a timely fashion, and visualize the project in different ways. In addition, most professional organizers will also coach you on how to maintain the organizing system, so overall you get a personalized system, an organizing personal trainer, and an organizing coach! Is there a hierarchy when it comes to organizing? Where must the organization begin? What a great question! Your home is a system, so everything influences the other, and many times there is a trickle down effect in homes – organize one space, and other things start to organize themselves. Thus at times, to organize a baby’s room or create a nursery, we have to tackle other rooms first to make space for the items in that room to live somewhere else. Is there a basic theory? it all about reducing? Can this be an acquired skill that sticks? Not really. If there is one basic theory for residential spaces, it is that every item in your home needs a home. However, organization is much broader than just your home, so there isn’t one overarching theory of organizing because projects and people aren’t the same. 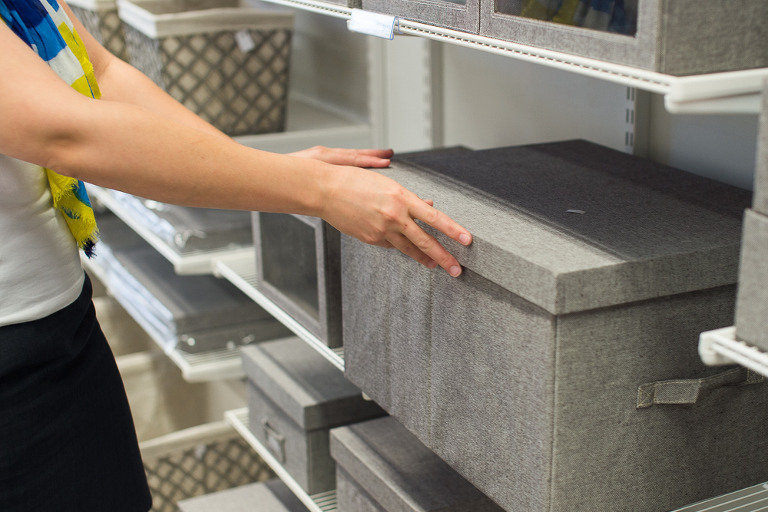 Organizing really needs to be tailored to you. If it is build and crafted around you, you will be able to maintain it so much easier! Organizing systems aren’t static though. So as you grow and your family grows, so must your organizing system. 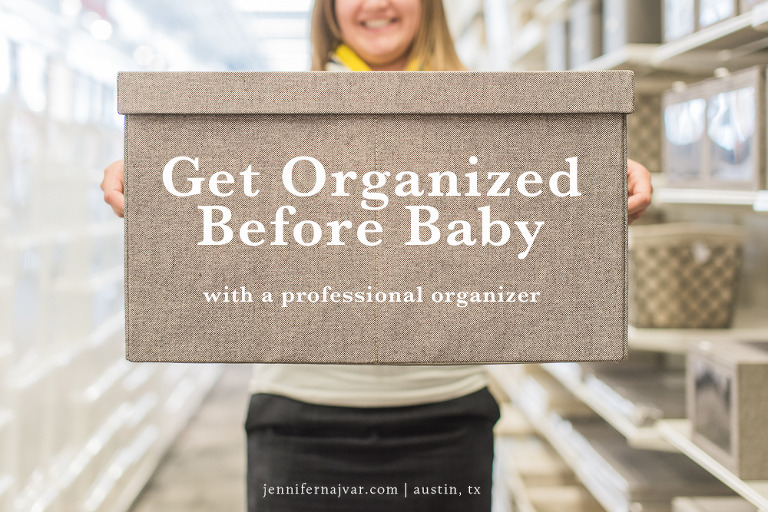 How you organized before baby isn’t going to be the same after, so just be aware and prepared for those changes! So, how can you prepare a household for the arrival of a new baby? I can work with you to prepare for a new baby by creating the space you need for your expanding family – if you need a room repurposed and all those items rehoused, or if you need to maximize a small space for a nursery, I can help. In addition, spending some time thinking about how a baby will influence your whole house will really help. You will need space in your kitchen for bottles, your pantry for new foods, your laundry room for different soap. Your whole home will have to have some sort of update. The update doesn’t have to be huge, but your organizing system must change with the advent of a new child. The new system will be different, but not bad. I think it’s the facelift throughout the entire home that can be overwhelming since most new parents will spend most of the time just focusing on the nursery. The nursery is paramount and needs organizing, but the whole home, and your schedule, and how you mange your time and energy, need to be thought through as well – and I can walk with you as you think through those things and facilitate some new habits. Parents are often bombarded with gifts of toys and baby clothes – how do you suggest families handle the influx of so much new stuff? Empower yourselves with the word “no.” Say “no” to things, gifts, donations, items on loan, etc. If you do not want it, say “no.” If not, you’re child’s room will be stuffed with items you do not like, you do not want, and your child will likely not ever play with! Kids can only play with so many toys at a time, so less really is more! Most people don’t want to offend, so think of kind ways to say “no.” Have a registry that is accessible to people in lots of different places, or have alternative and creative gift ideas – toy library subscriptions; parent and baby groups subscriptions, classes, lessons, massage, acupuncture, a baby sitter, a year long maid service, gift cards (be specific and have ideas on hand!). What are the benefits of starting out with a well-organized home for new parents? Mental? Health? Quality of Life? Stress relief? How does this affect the child? There are tons of benefits of getting organized in general, but especially for new parents! The benefit really depends on the person, but I really believe that having organizing systems that work for you, that you trust, and that you use will make your routines easier (you can find your belongings), save you time, reduce your stress, and allow you to maximize your energy. The benefits don’t stop with the parents either. If your home is peaceful and a place of calm and rest, then children will sense that and grow and thrive in that environment! I do think children brought into an organized environment and who grow up seeing organizing systems functioning learn how to organize and use the system. The idea of “a place for everything and everything in its place” is great for kids and can be made into a game for clean up and ownership of the organizing process. Do you have any ideas about trying to raise a new child who leads an organized life? There are a number of tips and tricks. One is to model the behavior your self. Your little ones are watching; always watching and learning, so if they see you take something out and put it away and have systems for how items enter and exit your home (i.e. paper flowing in from the post box to the “to act” file to the recycle bin), they will learn it. Also, expect that behavior from your child as your child grows and can act independently. A second idea is really to manage the amount of items a child owns or has access to. I love the idea of toy libraries. If you do have an influx of items from a birthday or holiday, then keep some up in a closet and spread out the introduction of the item into your child’s life over the year. You could also have a notebook in your play area with pictures of toys, so to get one out of the library, your child has to return a toy. Also, make the clean up a game and make it easy! Have bins and baskets without lids, so items can be tossed into the bin. Have an icon or photo of the items in the bin, so your child can associate the toys with what goes into the box. And let them help you and then do. It will become part of the “end of day” routine. Be consistent with this routine. This is for older kiddos, but it is something to work toward. The schedules of new parents can be completely disrupted. Can you help with time organization? Knowing that your time is no longer your own is really powerful. You now have a life that is totally dependent on you, so some days will be derailed with colds, scrapes, blow-out diapers, etc. The best thing is to give yourself grace, have both partners totally involved in the child caring process, give yourself extra time to get places, and don’t sweat the small stuff! You might have a sick kid or a really active kid or a really shy kid – that will effect your day, schedule, socializing, shopping, and everything else. Organizing can really help to start to think through some of these things, but also to start getting a better handle on time management and how long activities take. You might run into the grocery store now and be out in ten minutes, but that will expand with kids. Organizing can help plan meals for the week, plan errands, and so your time and energy is used most efficiently. Are there virtual organizing tips for new families? Apps? Calendars? Specific to new parents, etc? There are a lot of great digital applications out there to help with organization. My advice is to find the one you like and stick with it. Organizing tools only work if you use the tool and trust the tool. If you brain dump into one place, then you trust that all your bits and bobs of info and “remember this” is in that one place. If that is an app or a paper planner, run with it! If you could share one bit of advice, what specific organizational goal would you encourage an expecting family to prioritize? One specific organization goal for expecting families to prioritize would be to limit the amount of items you ask for and receive with a new addition. This is very much tied to a previous question and answer, but children do not need as much as they have or are given in most cases. Just because you can put it on a registry or think it’s cool doesn’t mean you need it. Also, just because you have been given something, doesn’t mean you have to keep it. If you are given items you do not like, then sell or donate them – someone might really love it and could really use it. Free yourself from the guilt, but also, empower yourself to say “no” to eager gift-giving family members and friends. Once you help with the initial organization, can a family successfully maintain? Absolutely! One of the things I do is coach you on how to maintain your organizing system and how to update the system as your child(ren) get older. Remember organizing systems are dynamic! How can a new family retain your services? I work in packages that are crafted around your needs and goals. After an initial phone call, I can start getting an idea of what kind of package you’ll need (i.e. a downsizing package or paper flow or space repurposing). Then I’ll come and assess the space(s) in person and solidify which package is best. Packages include different things for various projects, so you can check out the details on my website or always call me! When is the best time to get started with your service for a family who is expecting? This is a great question and there are two answers! One, if you need to repurpose a room for your new arrival, then call me earlier in the pregnancy, so we can get started on finding new homes for those items and getting the nursery ready. Early is also better since you won’t be as fatigued, and you can be integral in the downsizing and/or rehousing process. The other option would be to have me come after your big baby shower (if you are having one). Then, I can help find all the new items a home! I would not recommend organizing in the last month of your pregnancy since you will be tired, likely uncomfortable, and probably not in the mood to go through a box of old paperwork!